In October 2015, Atlanta celebrity chef Ford Fry’s highly-anticipated State of Grace made its debut in a bright and airy River Oaks space. In his first Houston venture, Fry, a James Beard-nominated chef, teamed up with executive chef Bobby Matos to create a southern menu inspired by Houston and the Gulf Coast. 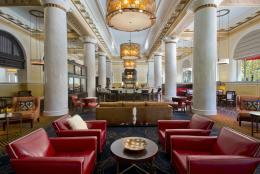 clubby banquettes, while a stunning oyster bar sits center stage for walk-in patrons. On the menu, fresh catch like the scallop crudo or lobster hushpuppies quickly emerged as fan favorites, not to be outdone by the Korean fried chicken wings or duck carnitas. In addition to signature cocktails, State of Grace’s well-priced wine list add to the restaurant’s appeal. State of Grace is open for lunch, Monday through Friday, and dinner daily. Menu: Executive Chef Bobby Matos strums a jubilant medley of old favorites played with new spice, accent, and freshness: southern, American, Latin, Gulf Coast, German, and Asian. Private Dining Room for seating up to 25 guests, Oyster Bar for cocktail receptions up to 35 guests. Full Restaurant buyout available for 100 seated guests to 200 cocktail/reception style.